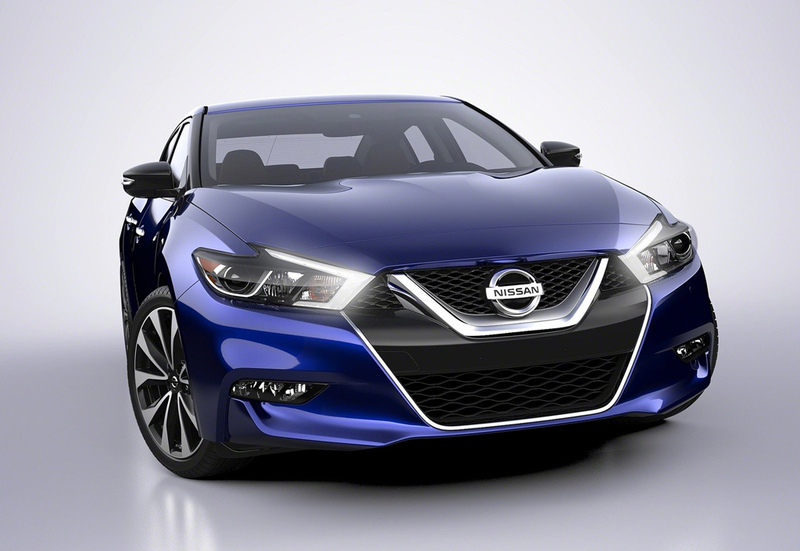 Nissan has taken the wraps off 2016 model of Maxima at 2015 New York International Auto Show. 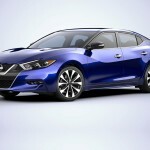 This all-new launch by the company is a 4-Door Sports Car with eye-grabbing looks. 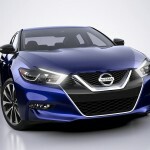 The new design language of Nissan can be very well seen in the V-Motion for the front end. The signature lights of boomerang shape make the car all the more worth buying. 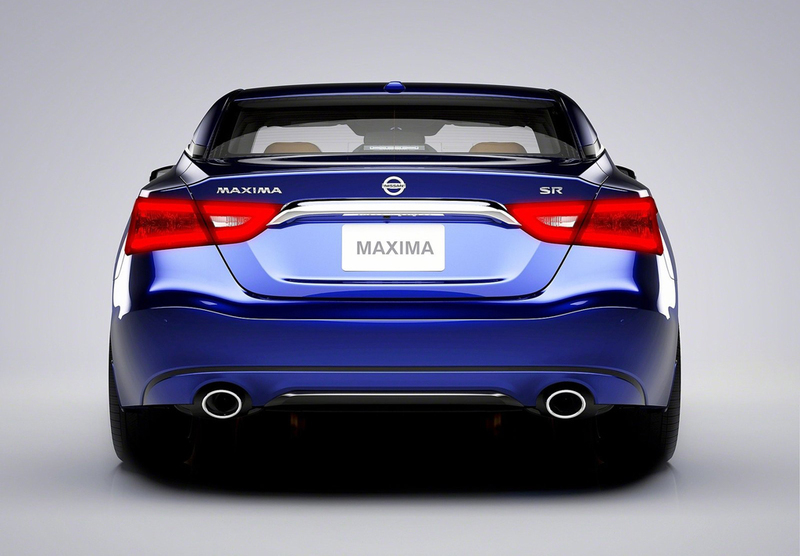 Maxima’s roof that appears to be floating is another feature that makes this model stand out in the crowd. The roof has been created by using blacked-out and thin pillars. 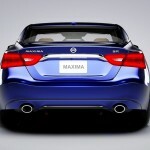 With this, the mass of the car becomes visually lower. 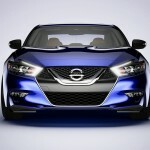 Customers are offered Dual Panel Panoramic Moonroof and visor windshield too. Another eye catching aspect of the exterior is the fenders which are wheel-oriented. The car runs on machined aluminum 18-inch alloy wheels. 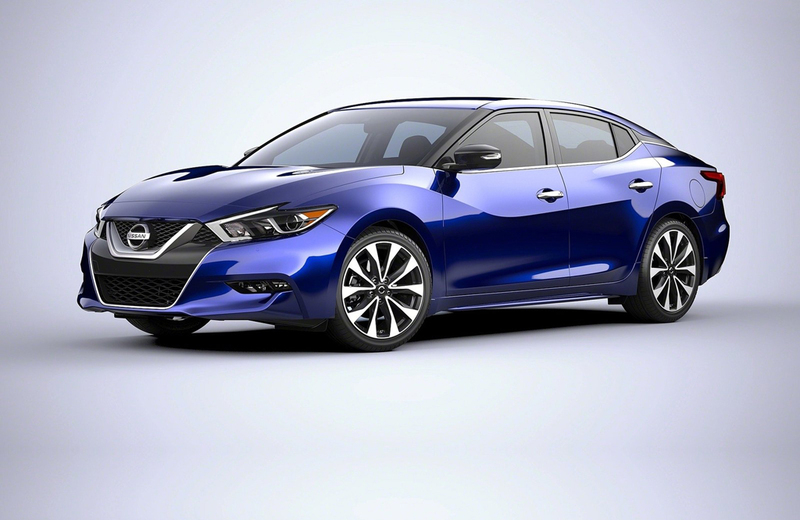 Buyers wanting to make a more powerful road presence can opt for the Maxima SR that features diamond-cut machined aluminum wheels of 19 inches. As compared to the previous generation, the car is longer by 2.2 inches and has been lowered by 1.3 inches. The customers can order mirrors for the exterior and the turn signals have been integrated into the mirrors. The feature tilt-down has been included as well. 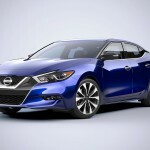 Nissan offers a cool range of colors with two new choices for this brand new model – Forged Bronze and Coulis Red. The luxury continues in the interior with exquisite looks and utmost comfort. The company has raised the height of the console and at the same time engineers had to meet requirements for seat movement and knee clearance. This has been very well achieved and high-quality padding too is an additional facility to the sides of console. Real stitching has been featured on console, instrument panel and center stack. The center information display has been tilted in the direction of the driver. The creators have located all the essential controls close to the driver. The shape of the shifter lever is similar to that of aircraft joystick. Push button start for intelligent key is now located at the console. Pulsing occurs on the start button with the entry of the driver into the cabin. Another switch that the console has is Display Commander. With this feature, the users can control the center display screen with just the touch of fingertip. A special bin can be seen on the console and has two auxiliary and USB ports. It is spacious enough to even accommodate iPhone® 6 Plus.An ingenious design of the instrument panel is not the only thing that Nissan has accomplished. Cutting-edge technology has been incorporated as well. Advanced Drive Assist Display is the in-meter display of 7 inches that is offered as standard. Another display is Fine Vision capacitive 8.0-inch color display. It has controls such as pinch and swipe similar to smartphone. The car makers have done a careful selection of the cabin materials. The diamond-shaped finishers appear to have been handmade. 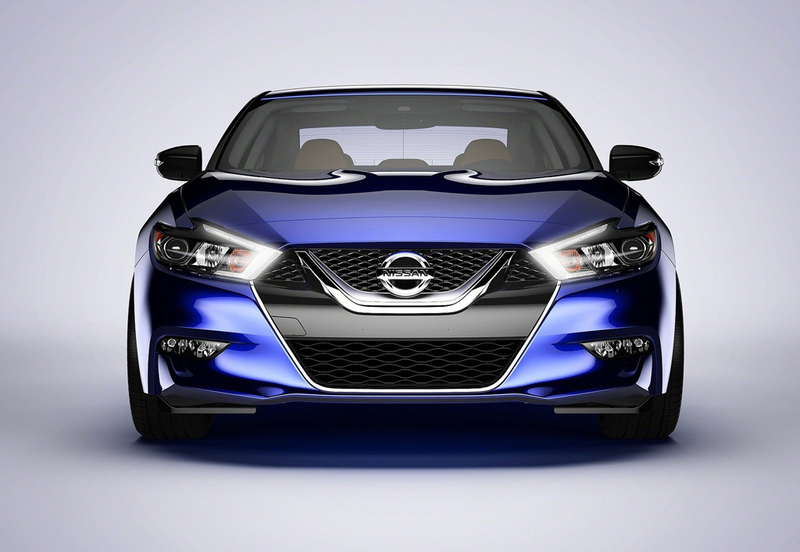 Matte and shiny finishes have been generously used for the cabin – including in steering wheel and the seats. Top-notch quality is ensured with the use of Ascot Leather in the seats. 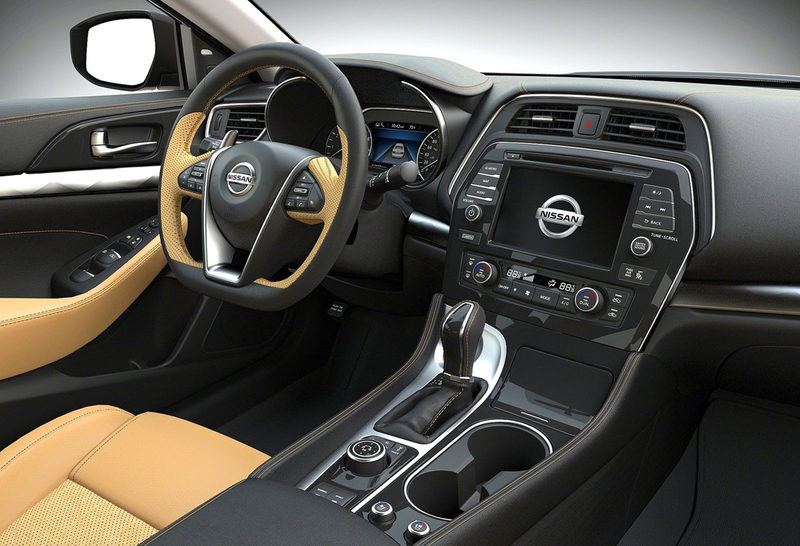 Moreover, the inserts are diamond-quilted and diamond-quilted Alcantara® inserts are offered on the SR variant. 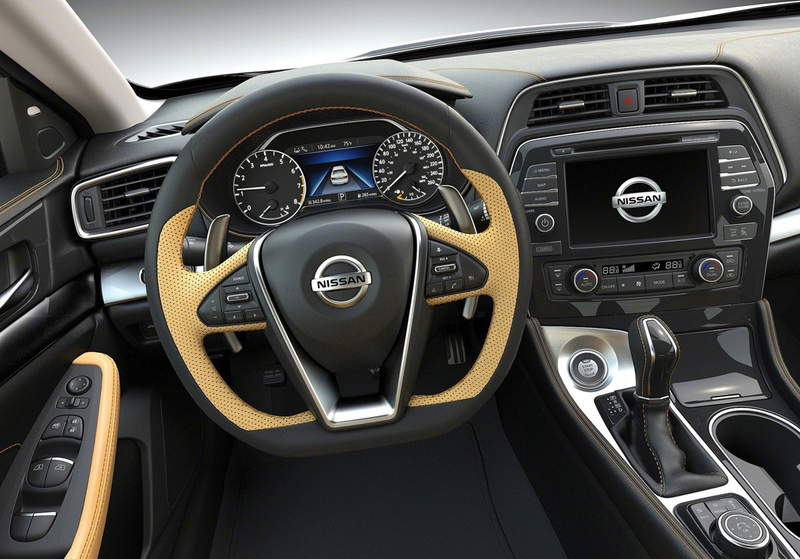 The steering wheel sports a distinct look with its D shape and the wheel can be had in Alcantara® insert. The color scheme too is very attractive and shows how much efforts the company has put in to give the cabin its best look. 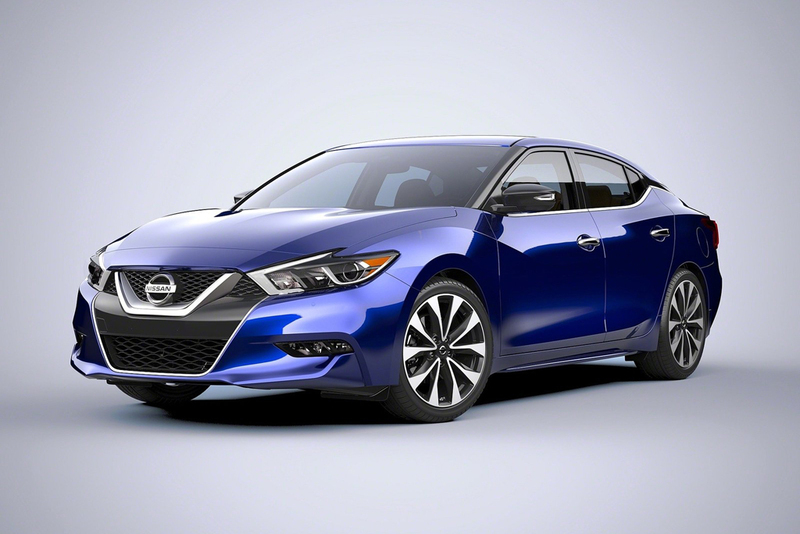 Diverting from the usual beige and black of most of the mid-size sedans, Maxima 2016 employs a rich and deep Camel shade. The Charcoal theme for the seats flaunts uniqueness with contrasting blue stitching.